Specifically designed light for floor standing enclosures that helps perform operations and maintenance in the field. Fluorescent lamp especially designed to fit onto the inside hole pattern of an enclosure’s frame. The housing of the light is made of mild steel, powder coated in RAL 7035. The power output allows lights to be connected to each other (daisy chain). An integrated electrical socket enables the use of additional appliances. -10 ºC to +40 ºC. Schuko. Other socket types available on request. Connectors for power supply, power output, and door switch. Fluorescent enclosure lights, available for different voltages and frequencies, for floor standing enclosures. 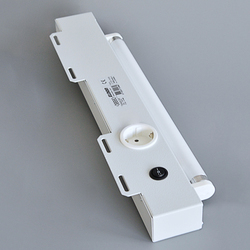 Off the shelf enclosure light, can be installed into enclosures that are located within different countries. The light can be easily mounted onto the enclosure's frame. The enclosure light has been specifically designed for the floor standing enclosure frame. The light ensures both operation and maintenance procedures can be performed safely, in the field.